I am absolutely thrilled to be an exhibitor at this weekend’s Alternative Press Expo (colloquially known simply as “APE”), a show I’m eager to attend because it has a profound place in my memory. APE was one of the first “big conventions” I attended as an exhibitor with my previous comic, Eben07, and we went for a few years in a row because it quickly became a favorite show to be a part of. It was well-managed like a larger convention but this show’s specific focus is on creators rather than large publishers. And it filled––when I last went––a majority San Francisco’s Concourse Exhibition Center, from the front doors to what amounted to the back walls, with nothing but indie artists and vendors. It was probably the most comfortable I had ever felt at a convention (to that point). One year, our booth was set up next to the booth of the indie video game developer, Double Fine. For two days, I was sitting and chatting with people who made art on games I played and loved and I even got to meet and quickly chat with the founder of the company, Tim Schafer, an inspirational creative guru of mine. 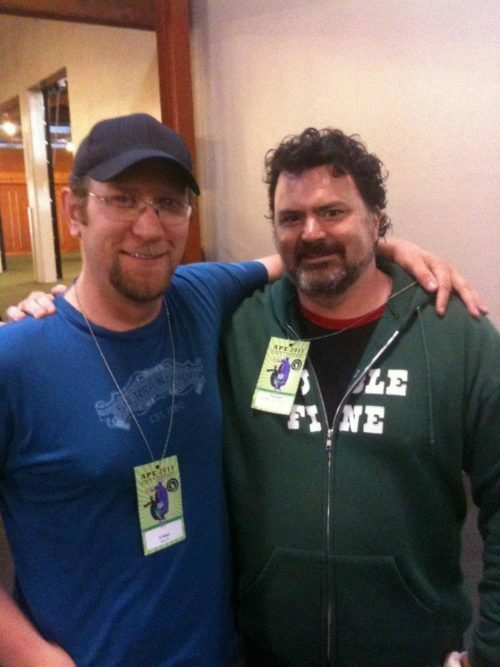 Photographic proof I once stood next to Tim Schafer at APE 2011. It was incredible to walk down the aisles and see so much original artwork and creator-owned books that it kind of felt like what the internet became for a lot of illustrators: an insulated conglomerate of independent-minded people doing their best and wanting to share it with others. It’s been awhile since I last attended, and some have said that the show has changed a lot (the least of which is it’s move to San Jose, CA, where the show originated), but that won’t sway me or my excitement for the show. I hope it has changed because I know I’m a different comicker now than I was then and I hope the show meets the needs for what independent comics are today. Change or not, I’m glad to be getting out there to more shows and APE is no exception.